Mary Lou McDonald speaking after meeting with Theresa May. British Prime Minster Theresa May came to the north "to pick a fight" with Ireland and the EU, Sinn Féin leader, Mary Lou McDonald, said today. The Sinn Féin President met Theresa May in Belfast this morning alongside Sinn Féin deputy leader Michelle O'Neill and Conor Murphy. The Tory leader is in the north on a two-day visit to discuss Brexit and other issues. 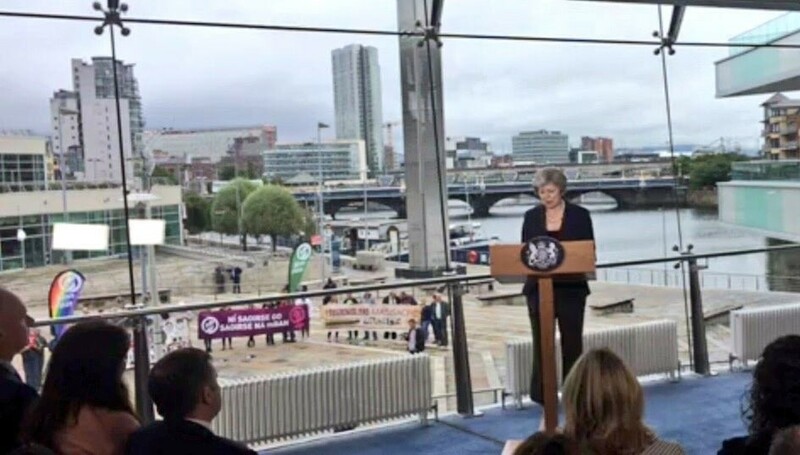 She visited the border in Fermanagh yesterday and made a speech in Belfast's Waterfront Hall this morning. She also met with party leaders during her visit. The visit sparked protests from a range of groups at several locations as republicans, anti-Brexit activists, human rights campaigners, relatives of victims of collusion, legacy campaigners, LGBT activists, Irish language activists and others held vocal demonstrations at Crescent Arts Centre this morning to demand action from Theresa May. A group of demonstrators from Sinn Féin also joined other campaigners outside the Waterfront Hall while the Tory leader made her speech. 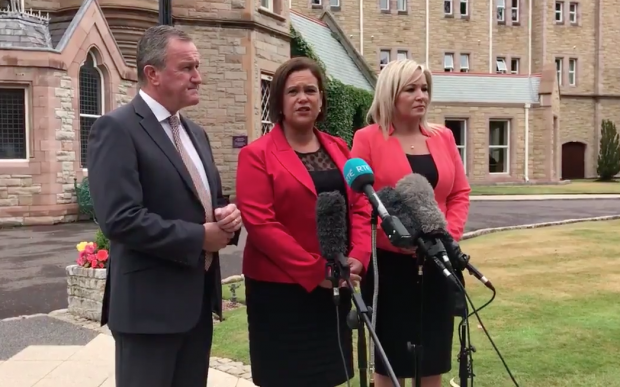 Mary Lou McDonald described Theresa May's visit and speech as "provocative" and said it did nothing to reassure widespread concerns over Brexit. "We were told that the British Prime Minister was coming two years after Brexit to calm and offer reassurance to people in the north of Ireland and beyond. As it happens her visit has been anything other than reassuring," she said. "It is now clear that the British Prime Minister has come here to pick a fight with the Ireland to pick a fight with the European Union," she added. The Sinn Féin leader also said Theresa May's speech "showed scant regard for the Good Friday Agreement, scant regard for the democratic will of people in the north who voted remain and absolute disregard for people's rights and entitlements" and added that it "might have been written by a member of the DUP." Speaking after meeting with the Tory leader, Deputy McDonald said she offered no reassurance about Brexit and the border. "We have heard nothing reassuring. We are not naieve to imagine that the British prime minister is in any frame of mind to listen much less to take heed to the needs of this island or the views of people here. "Right across society, business, farming and community interests, north and south are dismayed at the fact that the British prime minister uses hard Brexiteer rhetoric designed for Brexiteers and the Brexiteers within the DUP. "We need to reiterate again that Ireland will not be the collateral damage to the Tory Brexit, that there will be no hardening of the border on the island of Ireland and that the Good Friday Agreement is sacrosanct," she added. Mary Lou McDonald also called on Irish government and the EU need to challenge the British government on its rhetoric and to fulfil the commitments it has already entered into. "You cannot say there will be no hard border and then propose a course of action that will deliver a hard border. That is a nonsense and the British government need to be called out on it. "There is a big responsibility on Taoiseach Leo Vardakar and a responsibility on Michel Barnier and our partners in Europe to stand firm. "The British government need to understand that they can't simply arrive in Ireland and set out a plan that is so destructive to our interests and expect that there won't be a mighty reaction to that," he said.